A much plundered chambered cairn on South Clettraval (Cleitreabhal a Deas) hillside, on North Uist (Uibhist a Tuath). The surviving slabs of the burial chamber (in the photo) are set in overlapping pairs, so that the chamber walls look like the sections of a telescope. Some kerb-stones and some slabs of the façade are still visible. 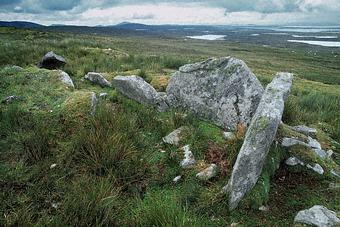 Little remains of the 29m long wedge-shaped cairn, from which the stones were stolen in ancient times. To the west of the site there are the remains of an Iron Age wheelhouse. During excavations in 1934 a lot of Neolithic and Beaker pottery was found. To the south there are a 1.5m tall standing stone and another much more ruined chambered cairn.